Billie Holiday is often considered to be one of jazz’s most prominent and influential musicians. Her unique vocal sound and style “changed the art of American pop vocals forever,” according to John Bush. While her pre-musician years were plagued with hardships, her success and influence led her to become not only a talented, respected vocal artist but also a social activist and champion in civil rights through her music. Holiday was born Elinore Fagan on April 7, 1915, in Philadelphia Pennsylvania, to Sarah Julia “Sadie” Fagan, a teenage runaway. Her father was suspected to be Clarence Holiday, the guitarist and banjo player of Fletcher Henderson’s orchestra, and it is from him and actress Billie Dove that she took her stage name (biography.com). Holiday’s father was not present in her life, one of many factors the contributed to a difficult childhood. Poverty, skipped school, and an uncertain future were staples of Holiday’s upbringing. Because of her truancy, she was sent to the House of Good Shepherd, a boarding house for “troubled African American girls,” but eventually dropped out (biography.com). On Christmas Eve, 1926, when Holiday was only 11 years old, she was raped by a neighbor, and subsequently returned to the House of Good Shepherd (Nicholson). After again leaving the House of Good Shepherd, Holiday found work in a house of prostitution in the late 1920s (biography.com). She had not yet turned fourteen (Nicholson). The brothel was raided and Holiday and her mother were arrested, and then they were released later in the year (Nicholson). All of these childhood experiences left Holiday with a library of past hardships and struggles, which created the basis of her often blues oriented musical career. She often “found solace in music, singing along to the records of Bessie Smith and Louis Armstrong” (biography.com). After her release from prison, Holiday worked with a tenor saxophone musician, Kenneth Hollan, and frequented clubs like the Brooklyn Elks’ Club, Pod’s and Jerry’s, and the Grey Dawn (Vail). Holiday soon expanded to several other local clubs, creating a reputation for herself as a talented singer, until, when she was 18, John Hammond discovered her while she was singing in a jazz club in Harlem (biography.com). Hammond paired her with Benny Goodman, an “up-and-coming clarinetist and bandleader,” to record vocals on the tracks “Your Mother’s Son-In-Law” and “Riffin’ the Scotch” (biography.com). Hammond reportedly felt that “her singing almost changed [his] music tastes and [his] musical life, because she was the first girl singer [he’d] come across who actually sang like an improvising jazz genius” (Gourse). Billie Holiday became well known through these musical collaborations, moving on to record with Teddy Wilson in 1935, Count Basie in late 1937, and then Artie Shaw a month after being fired from Count Basie (biography.com). However, it is for her solo career that Billie Holiday is arguably most famous. In the late 1930s, Holiday was introduced to the song “Strange Fruit,” which was a call to civil rights based on a poem about lynching (Margolick). Holiday, while afraid of retaliation for its performance, felt connected to the poem, saying “”It reminds me of how [Clarence Holiday, her father] died, but I have to keep singing it, not only because people ask for it, but because twenty years after he died the things that killed him are still happening in the South” (Holiday). Because of its controversial subject matter, Holiday was at first apprehensive about performing it. John Hammond would not allow her to record it, so she turned to her friend Milt Gabler (Lynskey). Strange Fruit would go on to sell a million copies in 1939 and become “one of the most influential songs of all time, thanks to its rare combination of potent lyrics, a decent melodic line and a beautiful voice” (Moore). Edwin Moore goes on to explain that “the song became a standard theme for the burgeoning civil rights movement, a song that previously non-political citizens could find themselves humming” (Moore). In short, Holiday had recorded a powerful protest song, which would go on to inspire and call to attention activists in the civil rights movement. Appropriately, on December 31, 1999, the final day of the century, “Time magazine selected Strange Fruit as its choice for the best song of the passing century” (Moore). Billie Holiday continued to record hits, despite multiple prison sentences, drug abuse, alcohol abuse, and abusive relationships that deteriorated her health and affected her voice. She was hospitalized on May 31, 1959, for liver and heart disease, when the police burst in and “busted [her] for drug possession as she lay dying” (Hamlin). Despite her difficult life (or perhaps because of it), Holiday is still hailed as one of the most influential and talented musicians of all time. Her music served not only to excite and delight, but also to inspire change and momentum in an unjust era. “Billie Holiday Biography – Facts, Birthday, Life Story – Biography.com.”Famous Biographies & TV Shows – Biography.com. N.p., n.d. Web. 18 Feb. 2013. <http://www.biography.com/people/billie-holiday-9341902>. Bush, John. “Billie Holiday – Music Biography, Credits and Discography : AllMusic.” AllMusic : Music Search, Recommendations, Videos and Reviews. N.p., n.d. Web. 18 Feb. 2013. <http://www.allmusic.com/artist/billie-holiday-mn0000079016>. Gourse, Leslie. The Billie Holiday Companion: Seven Decades of Commentary. New York: Schirmer Books ;, 1997. Print. Hamlin, Jesse. “Billie Holiday’s bio, ‘Lady Sings the Blues,’ may be full of lies, but it gets at jazz great’s core – SFGate.”SFGate: San Francisco Bay Area – News, Sports, Business, Entertainment, Classifieds – SFGate. N.p., n.d. Web. 19 Feb. 2013. <http://www.sfgate.com/entertainment/article/Billie-Holiday-s-bio-Lady-Sings-the-Blues-may-2469428.php>. Holiday, Billie, William Dufty, and Vincent Pelote. Lady Sings the Blues. Harmondsworth, Middlesex, England: Penguin Books, 1984. Print. Lynskey, Dorian. 33 Revolutions per Minute: A History of Protest Songs. London: Faber and Faber, 2010. Print. Margolick, David. 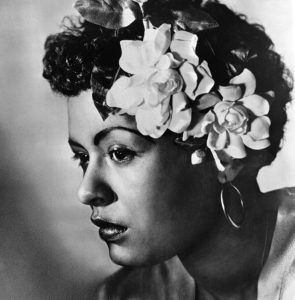 Strange Fruit: Billie Holiday, Café Society, and an Early Cry for Civil Rights. Philadelphia: Running Press, 2000. Print. Moore, Edwin. “Strange Fruit is still a song for today | Edwin Moore | Comment is free | guardian.co.uk .” Latest US news, world news, sport and comment from the Guardian | guardiannews.com | The Guardian . N.p., n.d. Web. 19 Feb. 2013. <http://www.guardian.co.uk/commentisfree/cifamerica/2010/sep/18/strange-fruit-song-today>. Nicholson, Stuart. Billie Holiday. Boston: Northeastern University Press, 1995. Print. Vail, Ken. Lady Day’s Diary: The Life of Billie Holiday, 1937-1959. Chessington, Surrey: Castle Communications, 1996. Print. Hi Amy, I think you’re mistaking my radio segment for someone else’s; I don’t air on Sundays and I’m not two women. Also, you might want to keep in mind that there are people behind the content that KHDX produces, and that while constructive criticism is greatly appreciated, blind vitriol usually is not.